'How can we talk to our children about Brain Injury?' This is a regularly asked question by parents who have suffered a brain injury and their respective partners. This book has been designed so that children between five and eight can read it independently. However, ideally it should be used with an adult to facilitate discussion about all aspects of family life and to enhance general emotional wellbeing. This book deliberately makes brain injury one of many things going on for this small group of children because for most children it is only one of many issues in their family life. This story is intended to emphasise that all families are different, with their own strengths and weaknesses and different experiences. Brain injury is another experience that some people encounter and others do not. 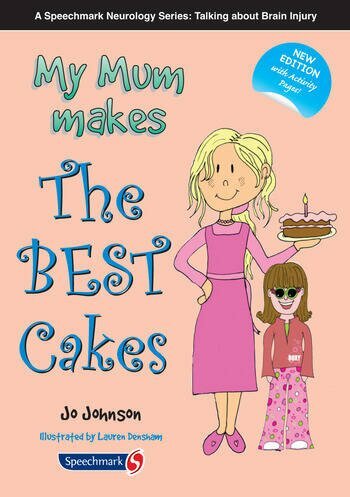 'My Mum makes the Best Cakes' should prove to be a great reassurance and comfort for children coping with a parent's brain injury. The book presents situations in which brain injured people can be angry, forgetful or unreasonable and shows that it is not the fault of either parent or child and children should not blame themselves. It also demonstrates the positive aspects of life with a brain injured parent and the enjoyable times that can be spent together'. Headway: The Brain Injury Association. "This book has proved to be a very useful support mechanism for service users and families in the Brain Injury Rehabilitation Trust. We are sure that this will continue to be the case, especially with the inclusion of new activity pages." (Professor Michael Oddy, Director of Clinical Services Brain Injury Rehabilitation Trust).